Montana State’s Harald Frey (5) is averaging 18.8 points and 5.2 assists over his last 13 games. Montana visits the Bobcats for a rivalry showdown on Saturday. 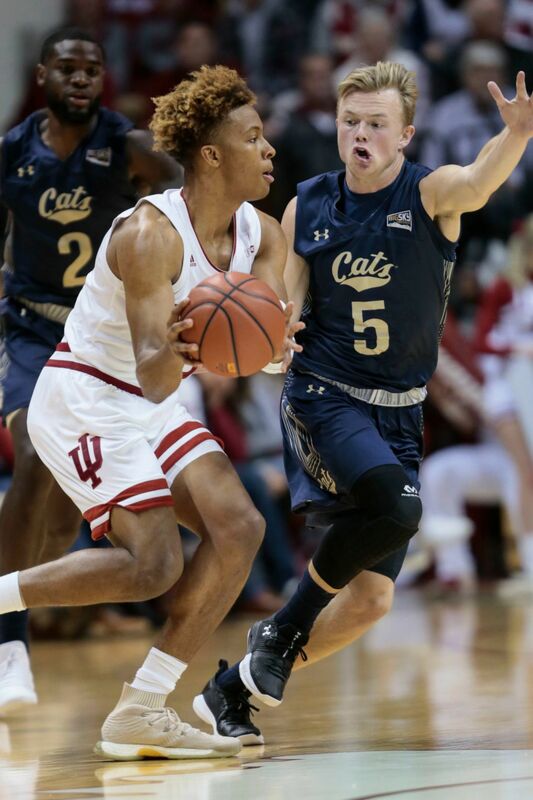 MSU guard Harald Frey defends Indiana's Romeo Langford during a game in Bloomington, Ind., on Nov. 9, 2018. An open mind is a big part of what has made Frey so valuable to the Bobcats — not only on the basketball court but as a student-athlete and an ambassador for the university as a whole. “I feel like it starts with just being a good listener,” Frey said this week during an extensive interview. “Sports are competitive and everyone has an ego. You put in an amount of work and you feel like you’re good at something, and as all competitors do they think they know what’s best. Nobody’s more coachable than Frey, as Bobcats coach Brian Fish has alluded to more than once during the junior guard’s career. And Frey has held the same attitude since he arrived at MSU prior to the 2015-16 academic year, traveling 4,500 miles from the fjords of his native Norway to pursue a college career on the hardwood. Compared to soccer, basketball isn’t a leading sport in Norway, though Frey immersed himself in the game in his hometown of Oslo to become one of his country’s notable young prospects. He was discovered by MSU assistant coach Chris Haslam, himself a native of Southport, England, during a tournament overseas. Emerging from Oslo’s Wang Sports Academy, Frey had gained experience as an amateur playing against older, more mature competition in Norway’s BLNO professional league — he was a teammate of ex-Bobcat Flavien Davis, who helped steer him to MSU — but wasn’t sure how he’d fit in playing on American soil. Frey started every game during his freshman season, averaging 12.7 points while shooting 45 percent and went on to win the Bobcats’ second consecutive freshman of the year award in the Big Sky Conference (following Tyler Hall). “Norwegian basketball is small, so you kind of know the guys that go overseas. They all tell you how difficult it can be,” said Frey, who was also courted by Drake and Miami-Ohio. “I tried to come in and think, ‘OK, maybe you’ll play, maybe you will not play.’ Maybe I wasn’t going to be in the rotation at all. At 6-foot-2 and 185 pounds, Frey plays a 94-foot game, with the ability to score and create on the offensive end and a willingness to guard and go to the boards on the defensive side. And the left-hander said he’s playing his best basketball right now. Frey is coming off a career-high-tying 31-point performance last Saturday in a 104-84 win over Idaho State. Frey caught fire in the second half and at one point scored 11 points in a 1:38 stretch to help the Bobcats pull away. Through his past 13 games, a stretch dating back to Nov. 24, Frey is averaging 18.8 points, 5.2 assists and is shooting 42 percent from 3-point range. Hall, who recently broke the Big Sky’s career scoring record, is MSU’s most attention-grabbing player, but Frey is the Bobcats’ engine and one of the top guards in the league, and that’s not lost on MSU’s opponents. “I think everybody’s tried to beat him up a little bit more here in the last month and tried to get physical with him. It’s a chess match,” Fish said. “They’re trying to beat him up, they’re trying to force him certain ways, trying to isolate him on certain quadrants of the floor. Frey’s assist-to-turnover ratio of 82 to 27 is in the Top 20 in Division I. Earlier this season, Frey became the 38th player in MSU history to score 1,000 career points. Born May 27, 1997, in Oslo, soccer was one of Frey’s first loves. He remains an avid fan, though he’s endured ribbing from his less-enthusiastic American teammates. Frey’s face lights up when the subject is broached. There was a time when Frey thought soccer may have been his sport of choice. But he comes from an avid basketball family — his father, Staale, has coached extensively in Norway while his mother, Hege, is still an active player after 45 years. Frey’s younger sister Anniken is also involved. He’d still dance circles around anyone with a soccer ball, but hoops is Frey’s true passion. And his grasp of the game is unmistakable. “I’m kind of a thinking-man’s player. I think that’s kind of how I base my game. I watch a lot of basketball and I think a lot of basketball,” he said. Montana State athletic director Leon Costello called Frey “the epitome of a student-athlete,” partly because of his positive attitude and bright personality. His willingness to travel halfway around the world to pursue basketball and a degree in psychology — Fish said Frey’s GPA is a healthy 3.75 — is also part of what makes him well-rounded. Frey, who said he is one of only three Norwegians currently playing NCAA Division I basketball (along with Matz Stockman at the University of Minnesota and Kristian Sjolund at Georgia Tech) has accepted those tests head-on. The game helps him get by. Last summer Frey represented Norway at the FIBA European Championship for Small Countries in San Marino, where he was named an all-star. Frey isn’t sure if he’ll remain in the U.S. when his time at Montana State comes to an end, but he doesn’t want to think about that yet. Frey and the Bobcats have a big game coming up Saturday night at home against second-place Montana, their arch rival. MSU has struggled mightily against the Grizzlies in recent years, having dropped 15 of the past 16 meetings dating back to the 2010-11 season. The Cats’ lone victory in that stretch came during Frey’s freshman season, a 78-69 win in which Hall scored 37 points. But it was a game that left Frey and his teammates wanting more. With veteran guards Ahmaad Rorie and Michael Oguine and big man Jamar Akoh, the Griz are the defending Big Sky champs for a reason — and they’re not a bad bet to win it again this year. But perhaps the Bobcats can reverse the aforementioned trends. The game will mark Frey’s 84th consecutive start. “The amount of work we put in, you definitely want some results to show for it,” Frey said. “We’ve come up short a lot of times in recent years. It’s definitely something we’ve been looking forward to. I think we’re hungry, I think we’re ready. “That game is a totally different atmosphere. It really means something to the people of Montana, and I think that’s awesome. I think we’re ready to give our fans the game they deserve and the success they’ve been wanting.